Start with an idea or concept that you are passionate about. The desire to explore it will be a driving force. The research will be a bountiful source of inspiration. And a solid theme will hang on this. Thoroughly imagine and create the 'world' of the setting. You'll be surprised at how this can carry you forward if you get stuck. Plan the infrastructure well: plot outline, writing style, etc, and the characters - be as meticulous as you want and know your babies really well, but be prepared for them to take detours. Create interesting support characters that help define the world/view/character of your protagonist. All roads lead to the ending, so have a clear idea of what that is and help the characters get there. Strong chapter beginnings and endings are integral and will keep those pages turning. They also provide the direction of the novel. Where are you taking the reader next? Set yourself a goal of a certain amount of writing every day, be it hours, pages, or words. This is your creative time and space. And keep writing forward when your ideas flow, you can always go back and polish to your heart's content when things start to slow down. perhaps look over your research or your characters, read something related to your theme and jot some notes. Or read whatever inspires you. Listen to music that inspires you. Keep that positive forward movement going! Think of the novel as a whole, work within its totality as well as its different components. Be patient, it is a long process, and be open to realising when it's time to finish. Terri Sedmak's desire to start writing began at the age of 11 after reading Ivan Southall's 'To the Wild Sky'. It was at this time she discovered she was both musical and creative. She went on to teach choir and music to primary school children, where she also co-produced school musicals, writing scripts and arranging and directing the music. With thoughts of publishing a novel never far from her mind, Terri left teaching to concentrate on full time writing, nine years ago. Given her life long passion and profound interest in American history and culture it was an obvious choice for Terri to research and write an historical novel set in Wyoming. Broad travels across the USA allowed her to walk in the footsteps of her characters and conduct further research. 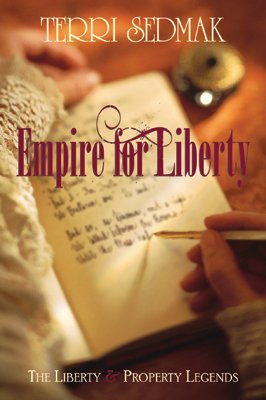 Empire for Liberty is the second novel in The Liberty & Property Legends saga, which will span six novels. Question: Can you tell us a little bit about Empire for Liberty? Terri Sedmak: Empire for Liberty is the sequel to Heartland On the Side of Angels and the second volume in The Liberty & Property Legends. It begins where Heartland leaves off, in which there has been a tragic murder by an unknown assassin. In Empire for Liberty you will find that the effect of this has been profound not only on the victimised Alliance families, but on those trying to investigate and solve the murder. Emmaline is a young reporter who is determined to unravel all intricacies of the situation. She becomes deeply involved in not only getting her story, but with the people she's investigating. And of course at the heart of the novel is Luke, who has even more heaped on his plate as he continues his quest. The novel has action aplenty, romance, lots of new characters and more about Liberty & Property woven through the novel. And loads more besides! Question: How does it feel to have your writing style likened to Bryce Courtenay? Terri Sedmak: Bryce Courtenay is one of Australia's most successful novelists, so it feels pretty inspiring. It's interesting that as a novelist you are driven to find your own voice when you write, because you want that point of difference and to be able to stand out, but often readers like to feel secure when they start to invest in a new writer and a comparison to another and successful author helps them take that all important step. Question: What originally inspired you to begin writing? Terri Sedmak: Reading a fantastic young adult novel when I was eleven. Ivan Southall's 'To the Wild Sky'. I so wanted to write a book after I'd finished reading it! I haven't stopped wanting to write since then. I remember when I was in Grade 6 our teacher asked the class to write a poem about a river. She was one of those teachers who really knew how to tap into the creativity of children. You don't forget those teachers. We all wrote our poems about a river, and when I read my poem, she said, "That's the kind of poem I'm looking for." I don't have that poem now, nor do I have that rather pathetic manuscript of my first attempt at a novel, although I certainly remember what it looked like, scribbled on a hodgepodge of any spare paper I could find. But I do have those first memories of what it felt like to create something with words. It's always with me. Terri Sedmak: It's important for me to be historically accurate, although in keeping with the series title, The Liberty & Property Legends, there is a legendary quality to the characters and their exploits. However, for me, whatever the era in which a novel is set or the genre, it is important for the reader to make a real connection to the characters, so often I do like to draw from people I know or real people and relationships when creating my characters. Question: Finish this sentence, The best thing about books is . . .
Terri Sedmak: that every book is an adventure and a revelation of the human experience.